BROWNFIELD, Maine - This is one stylish tent. After a half-mile journey through the forest, hauling gear in a sled behind me, we arrived at the mountainside yurt to find plastic wine glasses, a fondue pot, even a mini espresso maker. A welcome bag of granola sat next to the candles on the table. A quick inventory turned up a corkscrew, cheese grater, and pancake skillet. Embers from an earlier fire glowed in the wood stove and a tiki torch stood next to the outdoor port-a-potty. Those who think a tent means roughing it should try a yurt, a circular shelter with historical roots in Central Asia. Modern versions come with wooden lattice frames and are put on wooden platforms. There are vinyl windows and a skylight in the dome. There can be bunk beds and pullout futon couches. 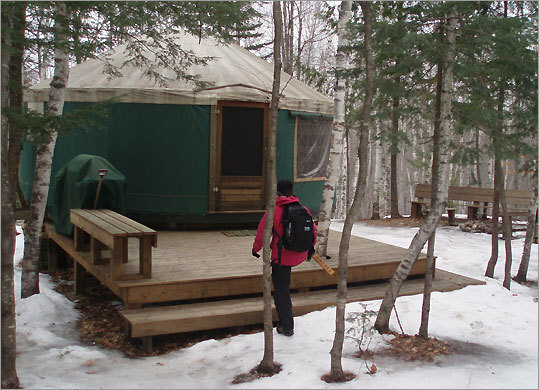 Frost Mountain Yurts has three of them along a small trail network on 60 wooded acres in rural western Maine. Opened in 2004 and owned by husband and wife Patrick and Erika Fagan, they offer a backcountry experience not far from civilization. A short drive from the region's hub in North Conway, N.H., they are a funky alternative to other lodgings. Going skiing? Try a yurt après-ski, perhaps with the fondue recipe - equal parts Emmentaler, Gruyère, and cheddar, 1/2 cup white wine, and 1 tablespoon white flour - we found in the yurt's logbook. Another entry told of a couple tramping back to the yurt in darkness after going to a local concert. Use the yurt as a game parlor, as we did for cribbage, first in the glow of the gas lamp and then by flickering candlelight. Two of the yurts are off a dirt road, a short two-tenths of a mile jaunt into the woods, over a bridge, and along a flowing brook. Guests can use the snowshoes, carts, ski poles, or sleds found at the self-contained check-in. The third yurt, which sleeps up to eight, opened in September and is a tad more remote. The half-mile trek crosses a snowmobile trail and leads to a winter view of hulking Pleasant Mountain and frozen Lovewell Pond. The yurts can be a jumping-off point to lesser-used hikes in the White Mountains. It's possible to hike or snowshoe up Frost Mountain, about a 90-minute round trip, to a Presidential Range vista. Other winter hikes, like the leg-stretcher up Fryeburg's Jockey Cap, are a short drive away. Snowmobilers use the old logging road to the bald summit of the small peak named after polar explorer Robert E. Peary who lived in adjacent Fryeburg. Each yurt has an information packet provided by the Fagans. "We want to be sure we answer all of the questions people have in the yurts," Erika Fagan said. Need a hot shower? There are even driving directions to those, more than 30 miles away. Information includes maps and directions to hikes and area attractions and a list of the couple's favorite area restaurants. Sometimes, though, people just want to stay in the yurt. Marty Basch can be reached at marty@martybasch.com. Rates: $85 night for 1-2 people, $15 each additional person.